That’s right, the Chicago Blackhawks lost three games this past week, all by the score of 4-3. If you want to look on the bright side, two contests went to overtime. They have gone beyond regulation 14 times this season, and currently lead the league with nine overtime losses. Well, at least they earned two points out of it this week. But that’s not really the point, is it? Actually, winning isn’t really the point either. Because like it or not, the rest of this season is about improving to make an impact next season. Are the Hawks on the right track? I’d argue yes. They might not be winning right now, but they’re looking competitive. Here are some highlights from this past week. We all knew Alex DeBrincat was going to be something special when he led the team in goals (28) last season as a rookie. In 47 games this season, he’s second on the team with 23 goals, behind Patrick Kane’s 25. He’s been especially hot of late, notching five goals in the last four games, two of which occurred Saturday night against the Golden Knights. His first tally of the evening was his 50th career goal, making him the fourth-fastest player to reach 50 goals in franchise history. In order to maintain balance in the lineup, head coach Jeremy Colliton had been deploying DeBrincat on the third line and his ice time was subsequently limited. But the young winger has been promoted to the first line alongside Jonathan Toews and Dominik Kahun for the last two matchups, as Colliton realizes he needs to give one of his top scoring threats more opportunities. DeBrincat has also been a mainstay on the top power play unit for most of the season, and deservedly so. Three of his above-mentioned five goals occurred on the power play, which leads us to our next section. Remember when the power play was anything but? It wasn’t that long ago. 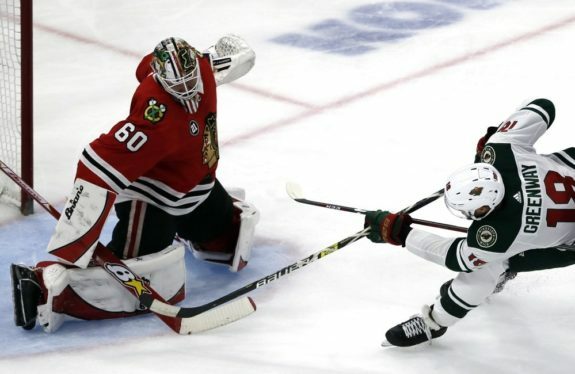 According to Charlie Roumeliotis of NBC Sports Chicago, the Blackhawks were 12-for-105 on the power play in the first 35 games of the season, with a conversion rate of 11.4 percent. They’ve now gone 13-for-36 in the last 12 games (34 percent), which is the best in the NHL in that span. Colliton is definitely leaning on the top unit that consists of Kane, DeBrincat, Toews, Dylan Strome and Erik Gustafsson. The three power play goals DeBrincat recently scored were assisted by Kane and Gustafsson. As you can see below, they’ve got that combination down to a science. But while Kane has perfected his cross-ice pass to DeBrincat, he’s always a threat to shoot as well, which he showed with a power-play goal of his own Saturday night. And one can never dismiss Toews and Strome, who do their best to be in front of the net to screen the goalie and catch deflections and rebounds. Not to mention Toews’ knack for winning faceoffs. Colliton recently discussed his affinity for this top unit with Mark Lazerus of The Athletic. We’ve already touched on Gustafsson’s importance quarterbacking the power play. He’s also tallied at least one assist (11 in all) in the last eight games. He looks to tie a defensive franchise record with a nine-game assist streak on Monday against the New Jersey Devils. It’s obvious this defenseman has huge offensive upside. But Gustafsson still has to play defense. And making mistakes in the defensive zone is what can get him, and his team, into trouble. In the last three contests, he’s been credited with two giveaways in each game. Wednesday’s matchup against the Predators was especially rough for the 26-year-old. He was the first to admit it after the game. Now here’s the thing. Colliton trusts that Gustafsson can figure it out. And he’s doing exactly what ex-head coach Joel Quenneville probably would never have done: give him the opportunity to make mistakes and learn from them. Gustafsson is playing on the top defensive pairing with Duncan Keith and faces the opponent’s top competition. And Colliton has indicated he doesn’t plan to change that any time soon. The promising defenseman is also averaging 22:14 ice time per game, which is second only to Keith. It will be interesting to see his progression through the remainder of the season. Can he find the right balance? Let’s talk about goaltender Collin Delia for a minute. In his first three starts of the season, he went 3-0-0 and only allowed five goals. In his next four starts, he went 0-1-3 and gave up 14 goals. In his last two games, he’s posted rather humble save percentages of .892 and .897, respectively. So is it time to pull the plug on the young netminder? Charlie Roumeliotis once again breaks things down for us. Through his first six starts, Delia’s high-danger save percentage during 5-on-5 play was .919, which is higher than Nashville’s Pekka Rinne who leads the league for the season in this department. Delia’s save percentage on low-danger shots was a perfect 1.00. His goals saved above the average goaltender stat was 8.58, more than a goal per game! The eye test tells a similar story. Delia looks calm, cool and collected out there. He doesn’t let anything faze him. He’s aggressive, confident and appears to be in control at all times. He talks the talk as well. I think just preparing before the game, we might have some breakdowns and my job is to be there. I can’t necessarily mitigate breakdowns, but I can be there to come up big, make a big save here and there. But there’s even been a few times where a couple breakaways have gone in that I think I could save and it’s my responsibility to take ownership of my role and I like doing it. 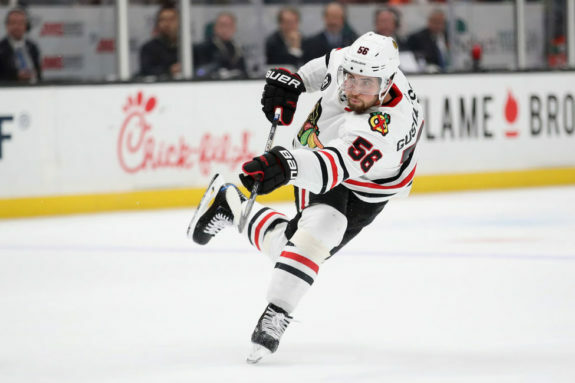 Delia’s played the last three games for the Blackhawks, and earned the starting role while Corey Crawford is sidelined. Sure, he could have his ups and downs, but for now Delia looks like the real deal. Here are a few more tidbits of interest from this past week, especially on the defensive end. Gustav Forsling was placed on injured reserve on Jan. 9 for an upper-torso injury, retroactive to Jan. 6. Colliton doesn’t anticipate him being out long-term. 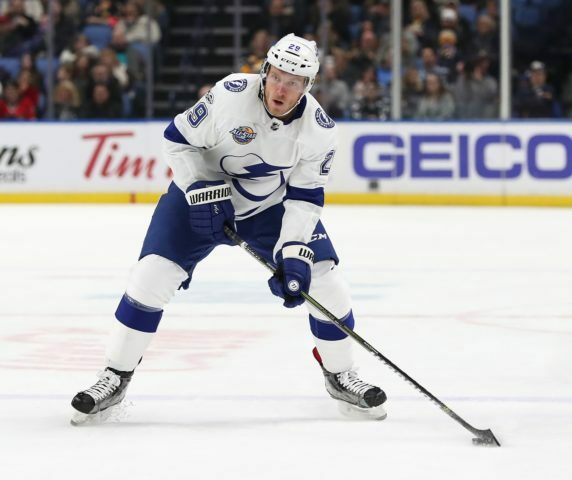 On Jan. 11, the Hawks acquired Tampa Bay Lightning defenseman Slater Koekkoek for defenseman Jan Rutta. Koekkoek hasn’t suited up yet for the team, but Colliton indicated he would get a look soon. Henri Jokiharju started on his off-side to the left of Brent Seabrook for the Hawks’ most recent tilt against the Golden Knights. With an overabundance of right-handed shots, the team wants to see how their best defensive prospect adapts on his left side. Brandon Davidson was assigned to the Rockford IceHogs on Sunday, Jan. 13. With Forsling on injured reserve, this leaves the Hawks with the preferred seven defensemen. Not to be left in the shadow of DeBrincat’s recent success, Kane has notched two or more points in the last four consecutive games. The Blackhawks haven’t lost back-to-back games in regulation since Dec. 11, a span of 15 games. After a brutal stretch of games against tough opponents in December and the beginning of January, things slow down a bit for the Blackhawks. They only have four more matchups scheduled for the remainder of January. The Hawks hit the road to take on the Devils on Monday and the New York Rangers on Thursday night. Then they host the Washington Capitals and New York Islanders on Jan. 20 and 22, respectively, before the All-Star break. Let’s see if the Hawks can continue to improve and be competitive. Heck, maybe they’ll even win a few games!